Grooming is very important for a man’s personality. As you know, the right kind of grooming can create a very positive impression in the minds of people. So it is time that you invest in a good grooming system and pamper yourself with a great makeover. If you are looking for a good grooming system, we have just the right product for you. 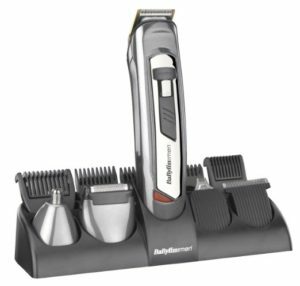 Here, we have provided you with a beard trimmer review of BaByliss 7235u 10-in-1 Grooming System for Men which will help you proceed to get the right product for you. This one is available on Amazon at a price of around £25.00. This product has been highly recommended by those who bought and used it. The trimmer is rechargeable with 5 attachments that are interchangeable in nature. Its blades are made of titanium and are armed with the latest technology. The nature of the trimmer is that of precision, approximately 0.5 mm. 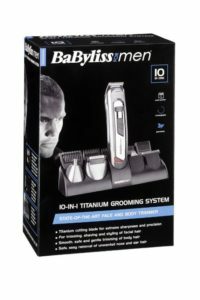 It contains Titanium Blade Technology and is such designed that you can shave with exact precision with no slipping. The blades are extremely sharp and help one to shave with the utmost perfection. The comb guide is of 5 position nature which ranges from 3 to 15 mm. The blending combs are of the jawline bending nature which is of the measurements 3 mm, 5 mm and 7 mm respectively. The body groomer is of the dimension 5 mm. It is also armed with a Comb Guide whose dimension ranges from 3 to 15 mm. The product has a guarantee of 3 years. The other ingredients of the system are lubricating oil which helps in lubrication while shaving. The trimmer comes with a charger along with a storage stand. It has the nose as well ear trimmers which will help you to pluck the unwanted hair which is otherwise difficult to remove. The product weighs 1.2 pounds. The system is extremely professional and helps in effective grooming and enhances the overall image of the man. The foil shaver helps in achieving a clean smooth finish. The detail trimmer is very helpful if you create hairlines and designs in your hair or beard. The trimmer has taper control which helps in obtaining a precise cut. Some of the customers have found it too blunt to use, and it gave them bad rash when using. The trimmer is said to barely cut half of the hairs that it is brought into contact with.